See the Colonial Grandeurs the Parliament house and the Rashtrapati Bhawan, popularly called the President’s Estate. This experience is where you feel like a royalty touching upon the seat of power from the past to the contemporary. Walk it partially and cover it on the wheels too, this is a share and slice of the English past. Designed by British architects, the city commonly known as New Delhi. 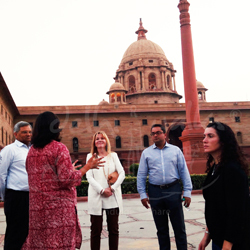 Walk on the Jan- Path, earlier known as the Queen’s Way and Raj-Path, popularly known as the King’s-way, and see the Colonial Grandeurs the Parliament. The story does not end there, when this architecture was a mark of permanency, the makers dissolved their power but the architecture remained strong. Admire the Massive archway known as India Gate, standing lofty at the center of concentric traverse commonly known as India gate circle owing its name to the massive war memorial- India Gate dedicated to all those who laid their lives for the country and the British Raj. Walk on the wide Jan Path and Raj Path roads with India gate on one end and Parliament and President’s Estate on the other raised higher than the other settlements on what is known Raisina Hills. This 19th century addition to the city of is known as New Delhi. A grand roadway, a massive structure and even influential stories of the people who got this city in shape. The last city within the eight cities of Delhi, this modern day space has emerged into the heart of the New Delhi that we understand. New Delhi has broad roads, nodes and greenery all around, however there goes a historic episode behind all that we see today. Take this walk if you wish to know more about English presence in the city of Delhi. This experience will cover all that is European in Delhi, all that glitters in Delhi and its broad roads.